I swear these lentils were red when I bought them. Granted, this delicious, spice-infused dish is nowhere near red in color, but I promise, it does contain tons of red lentils, garam masala and all kinds of other goodies that make it worth a try. Put lentils in a bowl and fill with enough water to cover lentils with an inch or two of water. Soak lentils for an hour before draining and rinsing. Heat oil in large, heavy pot over medium heat. Add garlic, onion and carrot, sautéeing for a couple minutes. Stir in garam masala, tomato paste, salt and one teaspoon smoked paprika and cook for another minute or two. Add lentils, coconut milk, tomatoes and broth to pot and bring to a boil. Reduce heat and allow soup to simmer, covered, for 30 minutes or until lentils and vegetables are tender. Remove from heat. Put shrimp in non-stick frying pan and dust with remaining teaspoon of smoked paprika. Cook at high heat for a couple minutes on each side until shrimp are fully cooked. 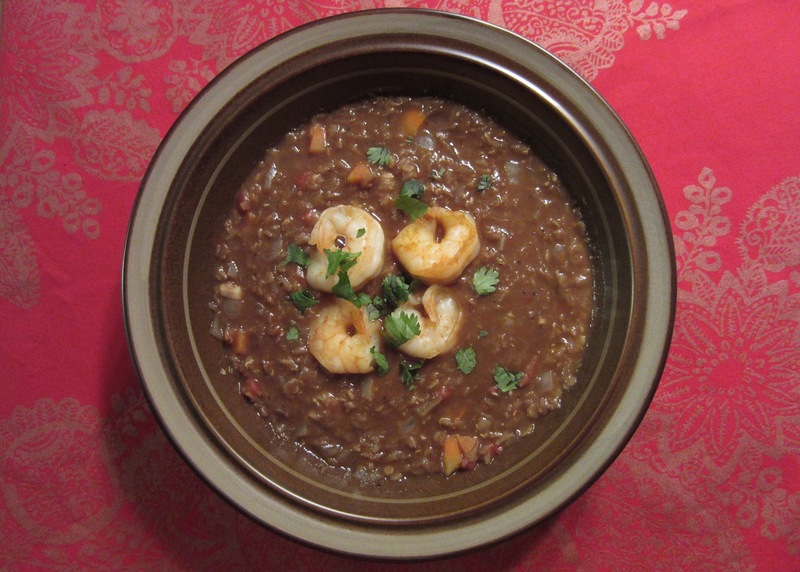 Ladle lentils into soup bowls, top with four shrimp and cilantro sprigs, and serve.